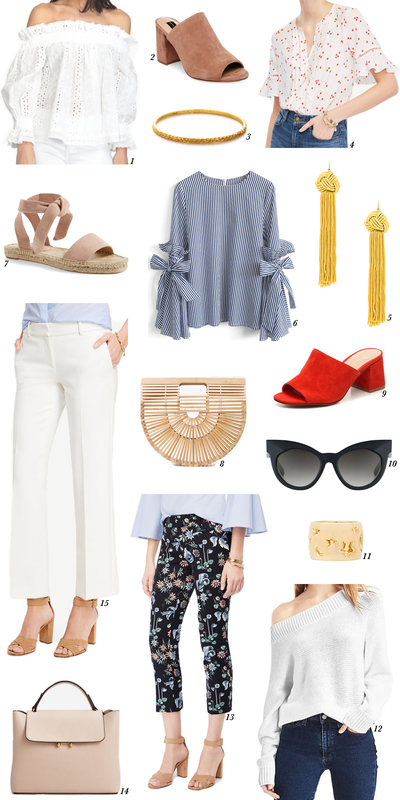 I can't think of a more perfect post to share today than this Spring wishlist. The sun is shining, the birds are chirping, and it's a balmy 60 degrees right now and will be getting up to 73 degrees later today! If that isn't a sign that Spring is close by, then I don't know what is. I've slowly been figuring out what key pieces I want to add to my closet for Spring. I just want to make sure that what I have is something that I will reach for versus just hanging in the closet never to be worn. And I think each of these pieces in this round up are things I would go to for any kind of occasion, whether it's running errands, going to church, or meeting friends for brunch. All of the items above are under $100 with the exception of the Luca Ring which is $115. But for a ring like that, I'd say it's a good investment, I can see myself wearing that quite often if not everyday. And clearly I have a thing for heeled mules right now (hence #2 and #9). *For #2, just use code SALE to get 20% off so that it is under $100. I didn't initially like them at first, but I am now a believer. They just make an outfit look like you put it together with such ease, I just love that. Okay, time to get outside and get as much Vitamin D as possible. Hope you guys have a great Friday and weekend!